Through the utilization of our proprietary, advanced SMART (Super Micro Atomization Retention Technology) microencapsulation process originally developed for the fortification industry, Wright has developed Wrise®, an economical, multi-functional microencapsulated leavening system for use in fresh, refrigerated and frozen chemically and/or yeast-leavened doughs and dry bakery mixes. 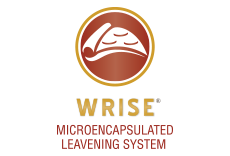 Wrise® will not react until exposed to oven heat during the baking process. Usage of Wrise® in baked goods is determined depending on shop conditions and finished product standards.